Tuesday starts quietly with Dan & Kate doing another 9 holes on the River Course at the resort. So I do some reading, and then walk down to try to find them on the course - but fail. (I'm told later that the course is amazing, but that their golf wasn't - and included some bad language - perhaps good that I didn't find them after all!) After a quick change we're off to the west side of the Bay of Islands, to the north-west of Corner Brook. We drop in to Marlaine's, a cafe & shop right on the waterfront. Its a charming cafe and we have tea & sandwiches. Dan strikes up a conversation about tourism with Marlaine herself, and we all have a very interesting 30 minutes - understanding further the various political issues (local and provisional) that effect the area. She knows her stuff! Marlaine and her sister Rose spoke about the number of whales that they see from her cafe, and that Rose had seen large numbers the previous weekend from the "look out". We drive on a few miles north to Bottle Cove, and then to a small car park on the eastern side of the cove - all great opportunities for more of Dan's photos - he was never like this as a kid!! Dan moves the car to the northern end of the car park, and suddenly declares that hes off to find the "look out" that Rose spoke of, as he feels sure its on the point above the cove. Kate and I join the hike and quickly we're in a wood and climbing upwards. Its worth the effort as after 10 minutes we break out above the cove and have excellent views back across the Cove and also out to sea. Dan's keen to go higher, and sure enough there is a breath taking spot where we really are as high as we can get. Next time, I'm bringing my sandwiches here, and they can leave me for the afternoon! WOW! They finally managed to drag me away, and we return to the chalet for another hot tub, and then the shuttle bus (a really good and friendly free service to get us round the resort) takes us to Strawberry Hill. 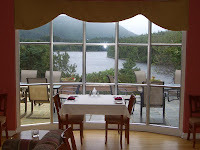 Strawberry Hill is owned by the same group as the resort, and provides "fine dining" in a beautiful setting. The host Ann-Marie knows Dan & Kate, and there is (as is often the case with these two) lots of banter. Again a good buzz about the place, even though its quiet. The food and service was excellent - we're all very happy, and return to the chalet.